Hiram Erastus Brown, who was also known as Erastus Graves Brown, died in Watervliet, New York, on May 20, 1904, and was buried in the Albany Rural Cemetery in Menands, Albany County, New York. He was a Private in Company F who was not present at the battle due to detached service. James Bustard was born on May 21, 1844, in Drumbar, County Donegal, Ireland. He was a Sergeant in Company I who was killed with Custer’s Column. Thomas Mower McDougall was born at Fort Crawford, Wisconsin, on May 21, 1845. He was a Captain, commanding Company B during the battle, and was with the pack train and in the hilltop fight. Hugo Findeisen committed suicide on May 21, 1881, at Fort Hamilton, New York, and was buried in the Cypress Hills National Cemetery in Brooklyn. He was a Sergeant in Company L who was not present at the battle due to detached service. Curley (left) died of pneumonia at the Crow Agency in Montana on May 21, 1923, and was buried in the Custer National Cemetery there. He was a Scout who rode with Custer’s Column. Louis Baumgartner died on May 22, 1895, in Washington, D.C., and was buried at St. Elizabeth’s Hospital East Cemetery there. He was a Private in Company A who participated in the valley and hilltop fights. William C. Williams died in Norfolk, Virginia, on May 22, 1919, and was buried in the New Vienna IOOF Cemetery in New Vienna, Ohio. He was a Private in Company H who was wounded in the hilltop fight. Michael Vincent Sheridan was born on May 24, 1840, in Somerset, Ohio. He was the youngest brother of General Philip Henry Sheridan and often served on his staff. He was the Captain of Company L at the time of the battle but he was not present due to detached service. William Clemens Slaper married his wife Sarah on May 25, 1882. He was a Private in Company M who participated in the valley and hilltop fights. Ami Cheever was born on May 26, 1849, in Elizabeth, Pennsylvania. He was a Private in Company L who was killed in the hilltop fight. Christian C. Boisen was born in Denmark on May 26, 1840. He was a Private in Company K who participated in the hilltop fight. Samuel James Foster died on May 26, 1884, in Manchester, Kentucky. He was a Private in Company A who participated in the valley and hilltop fights and was wounded. Michael Vincent Sheridan died on February 21, 1918, in Washington, D.C., and was buried in Arlington National Cemetery. He was a Captain in Company L who was not present due to detached service. He was the brother of General Philip Henry Sheridan. He was the brother of General Philip Henry Sheridan. Michael died the day after Philip’s funeral. William Gavin Capes was born in Portland, Maine, on February 22, 1849. He was a Sergeant in Company M who was not present due to detached service. George A. Rudolph was born in Meuterheim, Germany, on February 24, 1854. He was a Private in the Band and was not present at the battle due to detached service at Powder River, Montana. Thomas Mower McDougall was born at Fort Crawford, Wisconsin, on May 21, 1845. He was a Captain, commanding Company B during the battle. We was with the pack train and in the hilltop fight. Hugo Findeisen died on May 21, 1881, at Fort Hamilton, New York, and was buried in the Cypress Hills National Cemetery in Brooklyn. He was a Sergeant in Company L who was not present at the battle due to detached service. Curly (left) d ied at the Crow Agency in Montana on May 21, 1923, and was buried in the Custer National Cemetery there. He was a Scout who road with Custer’s Column. Louis Baumgartner died on May 22, 1895, in Washington, D.C. He was a Private in Company A who participated in the valley and hilltop fights. William C. Williams died in Norfolk, Virginia, on May 22, 1919. Alexander Brown was born on February 19, 1844, in Aberdeen, Scotland. He was a Sergeant in Company G and was with the pack train and in the hilltop fight. He died of syphilis in 1884 in Sturgis, South Dakota. Other Seventh Cavalry members who died in Sturgis included Joseph Bates (1893), Edward Garlick (1931), John E. Hammon (1909), Max Hoehn (1911), and John J. Mahoney (1918). 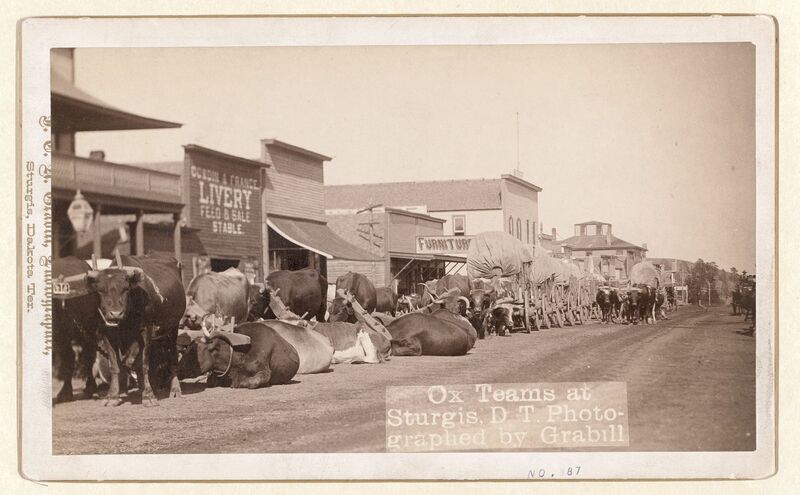 The photo (left) of ox teams in Sturgis was taken by John C. H. Grabill, probably between 1887 and 1892. Thomas Hughes, who was also known as Charlie Hughes, was born in County Mayo, Ireland, on February 21, 1845. He was a Private in Company H who was wounded in the hilltop fight. He died in Nashville, Tennessee, on August 12, 1911, and was buried in the National Cemetery there. Charles Ackerman married Ephresina Peterson on February 21, 1881, at Fort Totten. He was not present during the battle due to detached service at the Power River Depot. Michael Vincent Sheridan died on February 21, 1918, in Washington, D.C., and was buried in Arlington National Cemetery. He was the brother of General Philip Henry Sheridan. Dennis Lynch was born on February 22, 1848, in Cumberland, Maryland. He was a Private in Company F who was not at the battle due to detached service. He died in 1933 in Washington, D.C.
Jan Moller, also known as James Moller, died on February 23, 1928, in Deadwood, South Dakota, and was buried in the Mount Moriah Cemetery there. He was wounded in the hilltop fight. George A. Rudolph was born in Meuterheim, Germany, on February 24, 1854. He was a Private in the Band. He was not present at the battle due to detached service at Powder River, Montana. Charles Louis Haack died on February 24, 1902, at the U.S. Soldiers Home in Washington, D.C., and was buried in its National Cemetery. He was not present at the battle due to illness. Joseph Greene Tilford died in Washington, D.C., on February 24, 1911, and was buried in Arlington National Cemetery. He was a Major who was not present at the battle due to detached service.